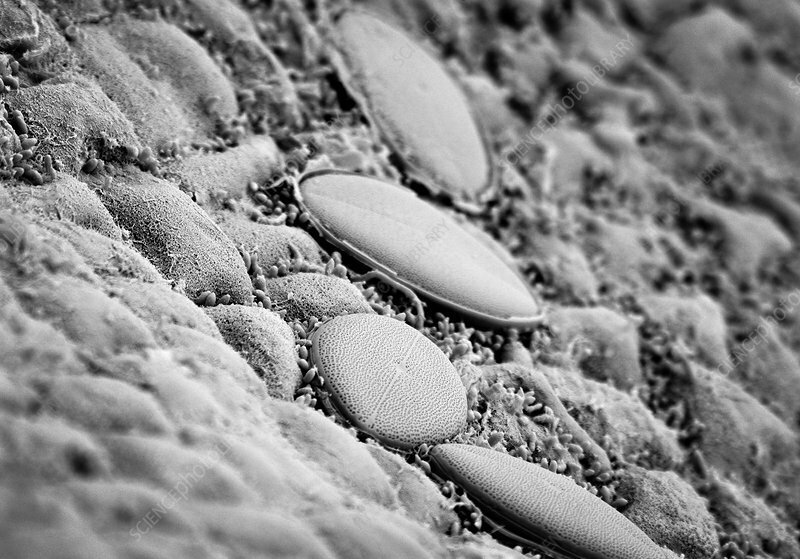 Scanning electron micrograph (SEM) of freshwater diatoms, a major group of algae and among the most common types of phytoplankton. Diatoms are unicellular, although they can form colonies in the shape of filaments or ribbons, fans, zigzags, or stars. The first diatom formally described in scientific literature, the colonial Bacillaria paradoxa, was found in 1783. Diatoms are producers within the food chain. A unique feature of diatom cells is that they are enclosed within a cell wall made of silica (hydrated silicon dioxide) called a frustule. Fossil evidence suggests that they originated during, or before, the early Jurassic period.